doctorsandhospitals.in > Medical News > Disease > What is cardiac arrest ? The sudden cardiac arrest (SCA) i.e. sudden heartbeat is sudden, as it is clear from the name it is absolutely and without any signs. 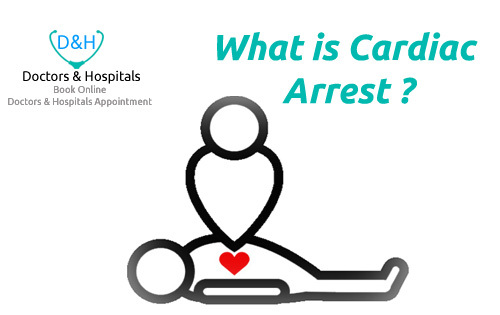 Most cardiac arrests are the result of irregular heartbeat. In this the flow of blood stops in the brain and other vital organs of the body, in which the heart stops beating in sudden and unexpected ways and it can also lead to the death of the patient. Often, the sad cardiac arrest makes people mistake their heart attack or heart attacks, but this is different. If it is not treated in a timely manner, then the victim can be killed within half an hour. Reduced blood pressure also decreases heart beat. Shock treatment is given in the treatment, which is called cardioversion. Being a heart beat slay can be immediately applied to a patient pacemaker, even then life can be saved. In its symptoms, breakdown of the nerve, irritation of the chest, sudden fast or slowing of beats, unconsciousness is the main. A cardiac arrest occurs when your heart stops circulating blood. If someone’s heart suddenly stopped working, if they do not breathe, then there is a reason for cardiac arrest in such a condition. Such victims should be taken to the hospital immediately. The most common cause of cardiac arrest is abnormal heart rate, ventricular fibrillation (VF) and this occurs when the fibrinogen is found in the blood in excess of which the heart stops communicating with the blood.